Ruth Negga as Tulip O’Hare in Preacher. 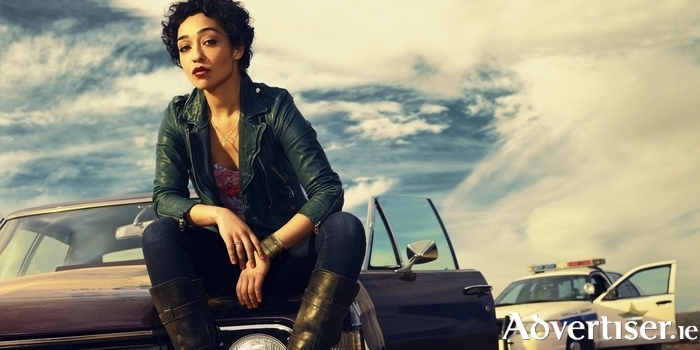 PREACHER, LOVE/HATE, and Marvel's Agents of S.H.I.E.L.D star Ruth Negga is coming to the 28th Galway Film Fleadh in July, where she will give this year's Fleadh acting masterclass. The Ethiopian-Irish actor - born in Addis Ababa to an Irish mother and Ethiopian father, and raised in Limerick, but now resident in London - is regarded by many as one of the most exciting acting talents to emerge in recent years, and expected to go on to great things. She can currently be seen as Tulip O’Hare in the AMC series Preacher, based on the hit graphic novel of the same name, opposite Dominic Cooper. Tulip is a volatile, hell-raising force of nature, and gifted criminal, not afraid to steal, cheat, or kill to get what she wants. This autumn Ruth stars in Loving opposite Joel Edgerton. It follows Mildred and Richard Loving, the couple behind the pivotal 1967 civil rights case, Loving vs Virginia. The interracial couple married in 1958 and were arrested and sentenced to one year in the state penitentiary. The sentence was suspended on the condition they go into exile from Virginia. The couple spent the next nine years fighting that ruling. Ruth’s other feature work includes John Ridley’s Jimi Hendrix bio, All Is By My Side, Stephen Bradley’s Noble, Marc Forster’s World War Z, and Neil Jordan’s Breakfast on Pluto. Hollywood screenwriter Kristen Smith is also coming to the Fleadh and will give this year's Screenwriters Masterclass on Thursday July 7 in the Radisson Blu Hotel. Smith, with Karen McCullah, has co-written some of the most popular films of recent years, such as Legally Blonde, 10 Things I Hate About You, She’s The Man, and Ella Enchanted. She has written and directed two short films - The Spleenectomy and The Multi-Hyphenate, both starring Anna Faris - and executive produced Whip It, starring Ellen Page and Drew Barrymore. A published poet, Smith is also the author of two young adult novels, The Geography of Girlhood and Trinkets, the latter is being developed for television. For more information on both masterclasses, and on how to apply, contact Brónagh Keys (091 - 562200, [email protected] ). Participants must be 18+ years of age. The closing date for applications is 1pm on Friday July 1.